Foodservice Steam Table Pans make your buffet the best it can be in any restaurant, hotel, or catering event. The stainless steel Steam Table Pans from Carlisle, Vollrath, or Update International are restaurant equipment that are essential for buffets and catering events throughout the foodservice industry to keep foods warm and serve from. Trust the restaurant supply superstore for your restaurant equipment. Vollrath Super Pan II Adaptor Bar - 12 in. Vollrath Super Pan II Adaptor Bar - 20 in. Vollrath Super Pan 3 Flat Solid Cover - 0.17 in. Vollrath Super Pan III Deep Food Pan - 2.5 in. Vollrath Super Pan 3 Stainless Steel Pan One Third Size - 2.5 in. Vollrath Super Pan 3 Stainless Steel Pan One Third Size - 4 in. Vollrath Super Pan 3 Stainless Steel Pan One Third Size - 6 in. Vollrath Super Pan III Stainless Steel Pan One Fourth Size - 4 in. Vollrath Super Pan III Stainless Steel Pan One Fourth Size - 6 in. Vollrath Super Pan III Stainless Steel Pan One Sixth Size - 2.5 in. Vollrath Super Pan III Stainless Steel Deep Pan One Sixth Size - 4 in. Vollrath Super Pan III Stainless Steel Deep Pan One Sixth Size - 6 in. Vollrath Super Pan III Stainless Steel Deep Pan One Ninth Size - 4 in. Vollrath Super Pan III Stainless Steel Full Size Deep Pan - 4 in. Vollrath Super Pan III Full Size Perforated Pan - 4 in. Vollrath Super Pan III Full Size Perforated Pan - 2.5 in. Vollrath Super Pan III Stainless Steel Half Size Deep Pan - 2.5 in. Vollrath Super Pan III Stainless Steel Half Size Deep Pan - 4 in. Vollrath Super Pan III Stainless Steel Half Size Deep Pan - 6 in. Vollrath Super Pan III Half Size Perporated Deep Pan - 4 in. Vollrath Super Pan III Stainless Steel Deep Pan - 6 in. Vollrath Super Pan II Full Size Perforated Steam Table Pan - 2.5 in. Vollrath Super Pan II Full Size Perforated Steam Table Pan - 4 in. Vollrath Super Pan II Stainless Steel Half Size Perforated Steam Table Pan 4 in. Vollrath Super Pan II Stainless Steel One Third Size Steam Table Pan 2.5 in. Vollrath Super Pan II Stainless Steel One Third Size Steam Table Pan 4 in. Vollrath Super Pan II Stainless Steel One Third Size Steam Table Pan 6 in. Vollrath Super Pan II Stainless Steel One Fourth Size Steam Table Pan 2.5 in. Vollrath Super Pan II Stainless Steel One Fourth Size Steam Table Pan 4 in. Vollrath Super Pan II Stainless Steel One Sixth Size Steam Table Pan 2.5 in. Vollrath Super Pan II Stainless Steel One Sixth Size Steam Table Pan 4 in. Vollrath Super Pan II Stainless Steel One Sixth Size Steam Table Pan 6 in. Vollrath Super Pan II Stainless Steel One Ninth Size Steam Table Pan 4 in. Vollrath Super Pan II Stainless Steel Full Size Steam Table Pan - 2.5 in. Vollrath Super Pan II Stainless Steel Full Size Steam Table Pan - 6 in. Vollrath Super Pan II Stainless Steel Half Size Steam Table Pan 2.5 in. Vollrath Super Pan II Stainless Steel Half Size Steam Table Pan 4 in. Vollrath Super Pan II Stainless Steel Half Size Steam Table Pan 6 in. Vollrath Super Pan II Stainless Steel Half Long Size Steam Table Pan 4 in. Vollrath Super Pan II Stainless Steel Full Size Steam Table Pan 4 in. 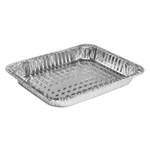 Update International Half Size Steam Table Pans Anti-Jam 22 Gauge - 2.5 in. Update International Half Size Steam Table Pans Anti-Jam 22 Gauge - 4 in. Buy Wholesale Steam Table Pans for your buffets. They are a valuable asset to any restaurant or hotel buffet serving warm or cold foods.